Around the world, diners of all stripes have come to know larb as part of the Thai culinary tradition – evidenced most recently by Aunt May’s (portrayed by Marisa Tomei) “I Larb You” Thai restaurant scene in Marvel’s Spiderman Homecoming. But the dish actually originated in Laos. While it hasn’t yet been nominated for UNESCO Intangible Cultural Asset standing, larb is considered unofficially to be Laos’ most prized dish. If you ever needed an ambassador of Lao cuisine, this savory meat salad ensemble would be your best bet. In its simplest form – larb is a dish comprised of minced meat, seasoned with lime juice, fermented fish sauce and a variety of other ingredients such as finely ground roasted sticky rice, chilli, mint leaves, onions, herbs and spices. When tossed together, they create a deliciously sophisticated blend of sour, spicy, salty and bitter flavors. Virtually any meat (bleu, medium, or well-done) can be minced and larb-ed. While pork, beef, chicken, duck, turkey and fish are the more household larb meats, special circumstances – whether it be economical or adventure-derived – call for other more exotic meats to be used. 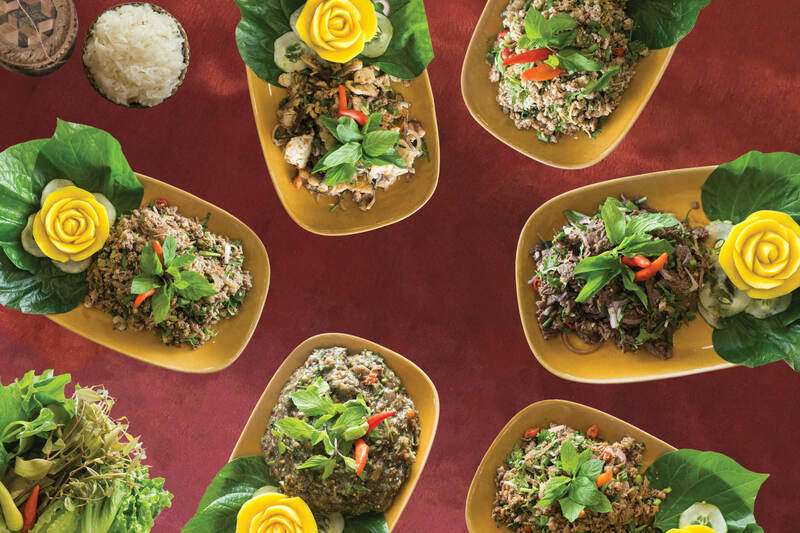 The likes of squirrel, rabbit, venison, horse, offals of all the above, quail, salmon, tuna, crab and many more have been enjoyed by larb enthusiasts in Laos. Even vegetarians need their dose of fresh tofu larb! Larb is often accompanied with sticky rice, but also can be had with its steamed variant. And no Lao meal with larb is complete without raw vegetables, especially green beans, lettuce, cabbage, cucumber, and whole spring onions on the side.